Available from leading manufacturer Rinnai is claimed to be the most energy efficient, low NOx and cost-effective range of A-rated water heaters across a range of load profiles compared with any other gas fired continuous flow water heaters on the UK market. The Infinity HDC1600i, tested to below 20 ppm NOx, produces the lowest emissions on the market, with 107% net thermal efficiencies. The newly developed unit with down-firing burner allows increased efficiency. The established award-winning condensing HDC1200 internal and external models show an impressive energy performance of 107% net thermal efficiency while the larger Rinnai HDC1500 internal and external models turn in 105% net thermal efficiency. The Rinnai Infinity Low NOx HD55i internal water heater is a room sealed, wall hung, LPG or natural gas fired continuous flow water heater. The Infinity Low NOx 55i is capable of supplying in excess of 980 litres at 50º rise per hour. Up to 25 units can be cascaded to satisfy any specification. 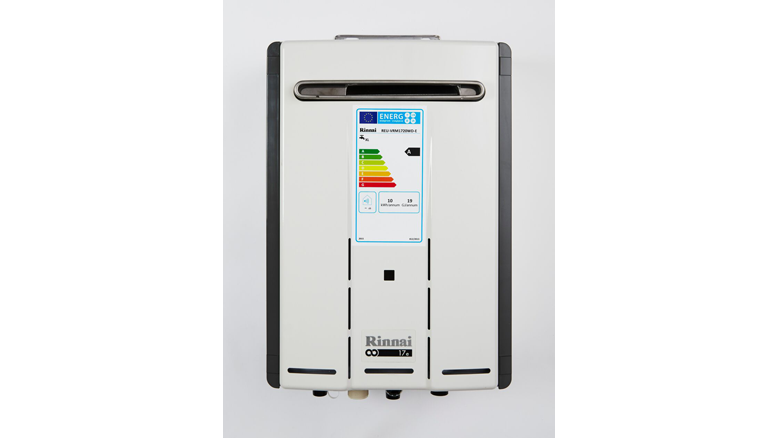 The Infinity Solo condensing, low NOx condensing water heater, is the first Rinnai product for the UK to combine the advanced technology of its wall mounted continuous flow water heaters with a stainless-steel storage cylinder in one compact unit. The Infinity Plus solution brings together multiple units of the company’s award-winning low NOx water heaters into single, easily manoeuvrable modules. All pre-assembled on ready fixed racks designed to fit through standard door frames. The Rinnai Bespoke Packs have been designed to provide better on-site efficiency and is supplied to site in one complete package, ready for instant installation. The A rated, low NOx system offers proven tested 105% efficiency and is G3 and Legionella (ACOP L8) compliant. The 24kW multipoint Rinnai Infinity 11i and 35kW 16i with push fit flue systems join the Rinnai Infinity 17e for external mounting to create a flexible range of domestic and light commercial water heaters that boast high efficiencies and on-going savings, with ease of installation and reliability.